The only tie-in book to the summer family movie about a 16-year-old girl who fought for and won the right for girls everywhere to play competitive soccer, inspired by one family's real story. 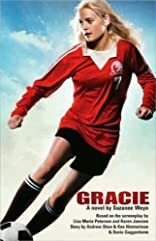 Set in 1978 in South Orange, New Jersey, Gracie tells the moving story of 16-year-old Gracie Bowen (Carly Schroeder of TV's Lizzie McGuire), whose middle-class family life revolves almost entirely around soccer. Tragedy unexpectedly strikes when Gracie's older brother, star of the high school varsity team and her closest confidant, is killed in a drunk-driving accident. Wracked with grief over her family's loss, Gracie decides to fill the void left on her brother's team by petitioning the local school board to allow her to play in the boys' soccer league. At first, no one can understand what Gracie is up to, not her mom (Elisabeth Shue), her former soccer star dad (Dermot Mulroney), the team or school officials. Everyone warns Gracie that pursuing her dream is a waste of time-that soccer is a sport for boys and boys only. Undeterred, Gracie finds reserves of strength she never knew existed, and persists in changing everyone's beliefs in what she is capable of, including her own. Based on true events in the lives of the Shue family (producer and co-star Andrew Shue, Academy Award�-nominated actress Elisabeth Shue and their family), Gracie is an exciting and emotional sports story that marks the dramatic feature debut of Academy Award�-winning director Davis Guggenheim (An Inconvenient Truth). This young adult novel includes an eight-page color photo section and a Q&A with Andrew Shue and Elisabeth Shue about the real-life story behind the film. 8-page color photo insert.